If you look around the web for examples of using Spring 3.1’s built in caching then you’ll usually bump into Spring’s SimpleCacheManager, which the Guys at Spring say is “Useful for testing or simple caching declarations”. I actually prefer to think of SimpleCacheManager as lightweight rather than simple; useful in those situations where you want a small in memory cache on a per JVM basis. If the Guys at Spring were running a supermarket then SimpleCacheManagerwould be in their own brand ‘basics’ product range. If, on the other hand, you need a heavy duty cache, one that’s scalable, persistent and distributed, then Spring also comes with a built in ehCache wrapper. The good news is that swapping between Spring's caching implementations is easy. In theory it’s all a matter of configuration and, to prove the theory correct, I took the sample code from my Caching and @Cacheable blog and ran it using an EhCache implementation. ...in your Spring config file to switch caching on. You also need to define a bean with an id of cacheManager, only this time you reference Spring’s EhCacheCacheManager class instead of SimpleCacheManager. "ehcache" has two properties: configLocation and shared. 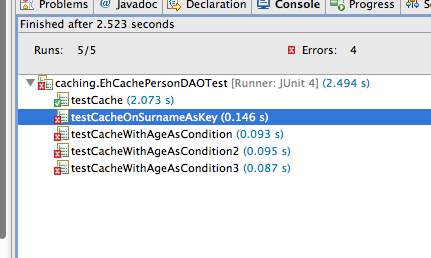 ...which creates two caches: a default cache and one named “employee”. If this file is missing then the EhCacheManagerFactoryBean simply picks up a default ehcache config file: ehcache-failsafe.xml, which is located in ehcache’s ehcache-core jar file. ...when you try to run a bunch of unit tests. I think that this comes down to a simple bug Spring’s the ehcache manager factory as it’s trying to create multiple cache instances using new() rather than using, as the exception states, “one of the CacheManager.create() static factory methods" which allows it to reuse same CacheManager with same name. 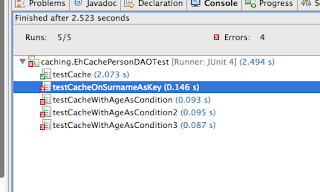 Hence, my first JUnit test works okay, but all others fail.